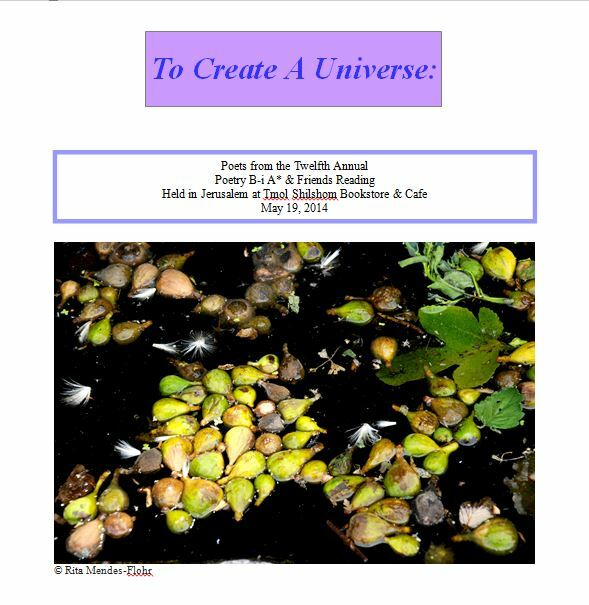 The Poetry B-i A 2014 Annual Poetry Reading was held at Tmol Shilshom Cafe and Restaurant in Jerusalem on May 19, 2014. As part of a commitment to creating community and dialogue among writers, I'm pleased to present this poetry chapbook consisting of poems from participants in the reading. To the right is an image of the chapbook cover, below are links to read and download the file. *The Annual Poetry B-i A Alumni Poetry Readings have been produced as an independent alumni program that is not affiliated with Bar-Ilan University. As poetry is an inclusive endeavor, premier poets and representatives from Israeli and international poetry organizations are often invited to read, as guests, along with BIU poets. Follow B-i A on Facebook: Poetry B-i A .